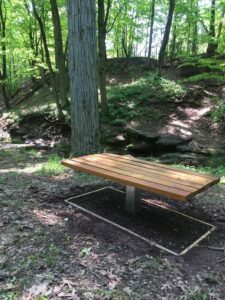 The Rutgers Student Chapter of the Wildlife Society installed a new bench in the heart of the EcoPreserve near the “falls” on Buell Brook. The metal stanchion was purchased by the club and the black locust lumber donated by the Kontos family. So the next time you are out in the EcoPreserve stop for a rest and take in the wonderful view and soundscape.